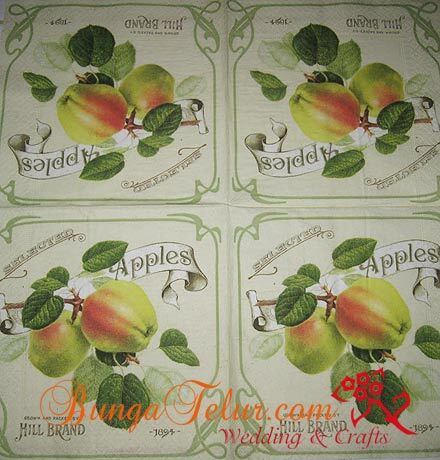 Another Decoupage In The House..
I’ve mentioned about this paper napkin with apple motifs in my other craft blog before. And I was planning to write about it in this blog as well, but as always, I am behind the time these days. I managed to seal the tin, applied primer and glued the motifs on. It took me about 3 days (or was it more?) to complete all the tasks. I have to really steal the time to do such stuff, like a quick 5-10 minutes before I took my shower and while Hubby took care of the little one..huhu! This is how it looks like after a 3rd layer of gloss varnish. I thought of putting opal dust on it, but after looking at the varnished output, I thought it is just nice the way it is now. 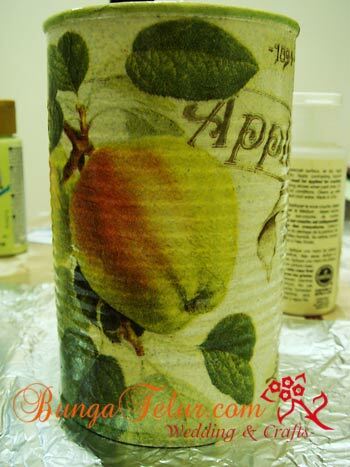 For those who are interested to try your hand in decoupage, hurry up and sign up for 3rd April class. You can make your own apple tin after you learn the basic in my class..heh! 2 Responses to Another Decoupage In The House..
wah. first time i dgr term ‘decoupage’ ni. ape exactly ye? the art of lekat paper napkins on tins/pasu? a ah syigim..gunting tampal je..boleh lekat atas apa sahaja..ada org buat decoupage kat pintu stor rumah lagi..hehe..